This is developing nicely. The beauty of all this is that if you don't like how it is turning out, you can go back and change things so easily. I like to set up a varied rhythm between the concentric circles. 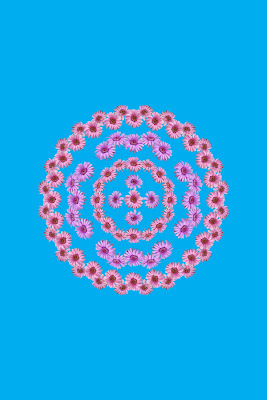 To do this, I vary the size and spacing of the rings and in this case; we are alternating between the pink and lavender flowers. We are going to create a ring of 24 blossoms and set them just outside our ring of 12. We choose a pink blossom and place it above our previous ring. Proceed as before through the first 4 layers. Now duplicate and rotate 45° creating a set of 8 layers. Duplicate and rotate 30°. Repeat. This gives us a ring of 24. Amazing, eh? How about we add a smaller ring of flowers and layer it behind the ring of 24? Now we have a double ring with 48 blossoms. Are you starting to get the picture and see the potential in all this? Save, duplicate, merge and get set to tackle phase 5.